This darling wallhanging is an excellent choice for any little boy's room. 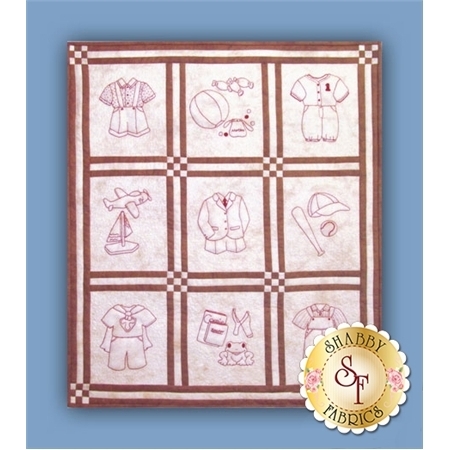 Five adorable outfits and four little boy themed items are hand embroidered and finished off with pieced sashing and borders. Pattern includes all instructions to complete the 24" x 28 1/2" project. Add the 2 pack of Frixion Clicker pens below which combines the convenience of a retractable pen with the incredible, erasable FriXion gel ink! Great for marking embroidery lines. 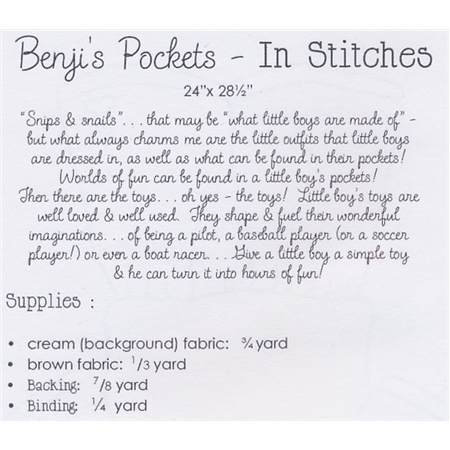 Or add the Micron Pen size 005 (.20mm) in Brown, which is also made for marking embroidery with a narrow, permanent line.